Restoring Regina's hair despite her severe burn wounds was an unexpected and emotional experience for her. 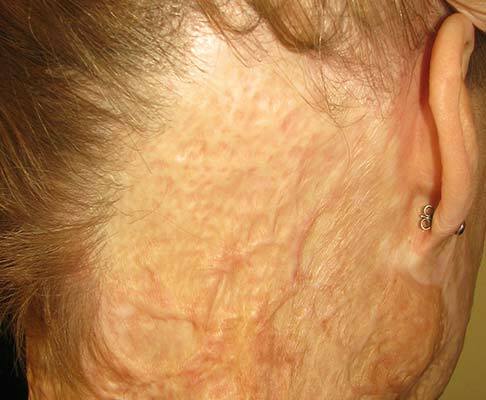 Scars Burns spread over the entire body, particularly on the face, back of the head, upperbody and arms. The president of Cicatrix, Regina Heeß (born 1949), suffered burns over 20% of her body in March 2000 when some methylated spirits ignited. Her face, the back of her head, her upper body and her arms were burned. In the years that followed, she underwent countless corrective surgeries. In 2004, she founded Cicatrix together with fellow burn victim Petra Lubosch. Cicatrix now has more than 800 members, making it the largest organization promoting the interests of burn victims in Germany. In 2004, her biography, Ik leef een tweede leven (‘Living my second life’) was published. She is also the co-author of a number of non-fiction books in this field. In January 2010, the German-language television station 3SAT broadcast a prime-time documentary about Regina Heeß, entitled Het andere gezicht: een vrouw, haar ongeluk en de schoonheid (‘The other face: a woman, her accident, and beauty’). This documentary was watched by more than half a million German viewers. Regina Heeß regularly gives lectures in Germany and abroad, and holds chairs at two nursing schools. As a co-founder of Cicatrix, Regina Heeß sees it as her duty to inform fellow burn victims as thoroughly and objectively as possible about treatment methods and medical institutes. Her goal is to enable all burn victims to receive the best possible care. For this reason she decided to undergo hair stem cell transplantation at HSI as soon as she heard about the treatments. Her expert evaluation of her experiences can be found on the Cicatrix website. In this test treatment, an irregularly-shaped bald spot was treated, measuring approximately 8 x 4 cm and located behind the right ear. Because the hair was worn long, this spot was not immediately visible. This second treatment, roughly the same location was treated. 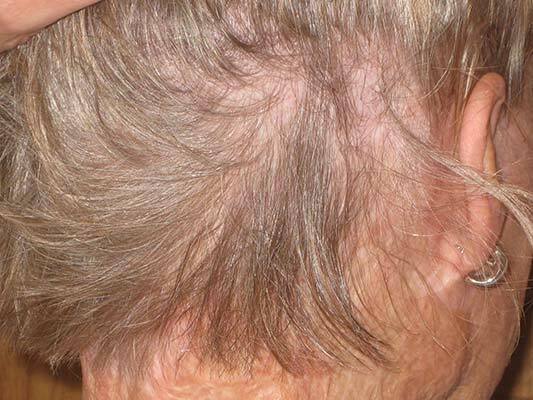 In order to create as much hair density as possible in the scar, more grafts were harvested. This meant, of course, that a larger donor area needed to be shaved, so that in this treatment, unlike in the test treatment, the donor area bordered on the receptor area. The success of the first test treatment not only convinced the patient of the effectiveness of Hair Stem Cell Transplantation, it also made her enthusiastic about it. Because the bald spot was difficult to see under her long hair, she had come to terms with it. The fact that her hair could indeed be restored turned out to be an unexpectedly emotional experience for her. As co-founder of Cicatrix, a German special interest group for burn victims, she will now be able to inform and advise her fellow burn victims on the basis of her own experience.